MONTEVIDEO, Mar 10 2010 (IPS) - “Nature is wise, and if we take the time to observe it, we can learn so much” is the underlying philosophy of a number of innovative programmes being carried out in Uruguayan schools that are using gardens as a teaching resource, explained Edith Moraes, director of the national Primary Education Board. One of these initiatives is the Community Gardens Programme conducted by the University of the Republic’s School of Agronomy through an agreement with the government of the province of Montevideo and the Primary Education Board. The programme provides the opportunity for direct contact with the land for boys and girls in 48 public schools in poor urban and suburban neighbourhoods of Montevideo. A similar goal is pursued by the Organic Gardens in Schools programme sponsored by Fundación Logros (Achievements Foundation), a non-governmental organisation that has been working with schools in Uruguay and neighbouring countries, primarily in rural areas, since 1996. The Organic Gardens programme currently involves 400 schools and 45,000 students, and has been expanded to include Argentina and Brazil with the support of the Organisation of American States (OAS). “What these programmes have in common is that they use gardens as teaching tools,” explained Andrea Crocco, an agricultural engineer and member of the Fundación Logros technical team responsible for advising teachers with regard to both the agricultural and social aspects of the programme. The Organic Gardens programme recommends the use of greenhouse-style protected gardens so that children can work in them year-round, regardless of the weather. It also promotes gardening in a way that “imitates nature, with a variety of different crops and using organic methods, with no chemical pesticides or fertilisers,” Crocco told IPS. The crops planted in the school gardens, depending on the season, include lettuce, arugula, Swiss chard, spinach, bell peppers, tomatoes, squash, zucchini, carrots, beets, melons, strawberries, flowers, and aromatic and medicinal herbs. However, “the emphasis is not on harvesting the crops but rather on the educational aims, the possibility of undertaking a task, making a commitment to it, and working as a team, because one person alone cannot maintain a project like this,” stressed Crocco. The gardens also serve as a novel means to teach mathematics, statistics, life sciences and other subjects. 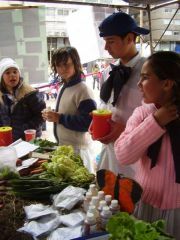 A number of years ago, María Leonor Rossi, the principal of a rural primary school in the province of Canelones, located next to Montevideo, observed that many local families travelled to the provincial capital, four kilometres away, to buy vegetables, despite the fact that they lived in the midst of an agricultural area. She decided to try to bring an end to this costly habit by encouraging the planting of a vegetable garden on every farm. Rossi, the principal of Las Violetas school, which is surrounded by vineyards and fruit tree orchards, showed the local residents that they did not need large areas of land to provide their families with the food crops they were buying in town. The initiative began with a three-square-metre greenhouse set up by Fundación Logros, and in time “the school became a role model for farmers in the area,” Rossi commented to IPS. The programme’s promotion of organic farming also improved local eating habits. “But the best part was that parents learned about these things from their own children, and saw the possibility of raising organic crops on a large scale,” she added. Eucalyptus leaves and crushed onions, garlic soaked in alcohol, orange peels and rice husks are some of the natural pesticides used to prevent ant infestations. Yellow and blue flowers help to repel harmful insects while attracting others that aid in pollination. “There are aromas and colours that have a special effect on insects, and when they smell and see them, they go to other farms, as the students say,” Rossi explained. Insect plagues are also prevented with infusions of Swiss chard and peppers, as well as wormwood, which is gathered from the forests near the school. In the heart of the northwestern province of Artigas, which borders Brazil, lies the town of Baltasar Brum, home to just over 2,000 people, where the economic mainstay is cattle and sheep farming. Marcos Arzoaga, a teacher at the local primary school, told IPS that the school garden programme here was started up in 2002 – the same year that teachers in various parts of the country reported that there were children in Uruguay forced to eat grass because of the steep rise in extreme poverty triggered by a severe financial crisis that devastated the economy that year. “The teachers at the school realised that there were a number of problems, including the fact that many children refused to eat vegetables, and we set out to change their eating habits, while improving the teaching of natural sciences and scaling up the experience from the school to the community at large,” said Arzoaga. At the time, he noted, out of 129 families, only 29 had vegetable gardens, although most of them owned land. “The kids were really motivated, and they took home their experience from the school garden. A lot of them wouldn’t even touch cabbage in the past, but now that it’s the result of their own work, they want to eat what they’ve grown,” commented Arzoaga, author of a book entitled “Una escuela productiva y sustentable” (A Productive and Sustainable School). The students are also responsible for managing the money raised by selling part of the crops they produce. “They handle the accounting with a bookkeeping ledger and book of receipts. Every month they report the current financial balance to the rest of the class,” he told IPS. With the profits earned from eight years of working (and learning) in the school garden, the students purchased a blackboard, chairs, CD player, TV set, DVD player and other supplies needed to set up and equip a “green classroom”. Last year they added a small fruit orchard and two greenhouses where they grow strawberries, as well as embarking on the raising of chickens. The eggshells are used as a natural pesticide to keep ants at bay, while the chicken manure is used as fertiliser. “Everything produced on the school farm is put to use,” said Arzoaga. Three years ago, Fundación Logros started up a fruit farming programme in rural schools that have at least a few hectares of land available to them. Peach, orange, plum, apple and other fruit trees are raised as part of the programme, implemented in conjunction with the National Institute for Agricultural Research (INIA), which provides technical support. Last year, the programme was expanded to 36 schools. “The idea is to provide a minimum amount of supervision alongside the teachers, so that the students themselves can keep track of the crops, observing how the trees grow and how much fruit they produce,” said Roberto Zoppolo, an agronomist from INIA and member of the Fundación Logros technical support team. For the school orchard programme, INIA selected tree species that are best suited to the climate and soil conditions, that can be successfully raised through organic farming methods, and that produce fruit during the months of the school year. In addition, “we tried to revive native fruit tree species like guava and arazá, which are indigenous to Uruguay but whose fruit is no longer commonly consumed,” Zoppolo told IPS. The executive director of Fundación Logros, Graciela Gancman, believes that one of the benefits of these programmes is that they promote the building of networks across the country. “The greatest contribution is the transfer of knowledge. It is essential to have adequate know-how and sources of information to know what to do in the event of insect infestations, bad weather and other external factors,” she told IPS. One of the keys to success is to ensure a diversity of crops. “If we look back on the gardens planted by our grandparents, who brought this knowledge with them from Europe, they didn’t plant rows and rows of lettuce; everything was mixed up together, a little bit of each vegetable to serve at the family table,” she noted. “This is a basic rule of nature: the greater the diversity, the greater the productivity,” stressed Gancman, who referred to the school gardens and orchards as “living laboratories” that enable learning through experience. Near the end of the year, when girls and boys from schools throughout the country present the produce raised in their gardens, a ceremony is held to coincide with World Food Day, Oct. 16, where the guests include representatives of the United Nations Food and Agriculture Organisation (FAO). “We are promoting healthy eating habits. A part of the food grown in the gardens is prepared in the schools, and this way the kids learn to make different vegetables dishes with recipes they can then take home,” said Moraes. In some cases, the gardens do not produce enough to fully supply the school cafeterias, but there are always enough vegetables to serve up a healthy salad with the first crops of lettuce and peas, she added. In other cases, surplus fruits and vegetables are canned or used to make jam or novel treats like carrot candy. During vacation time when the schools are closed, the gardens are tended by the parent school support committees, school caretakers, or teachers giving summer school classes. Now that the school year is beginning in the southern hemisphere, for the thousands of Uruguayan children who participate in these programmes, going back to school does not just mean reopening their books and listening to their teachers again, but also returning to their greenhouses and orchards to see what new lessons nature has to teach them.